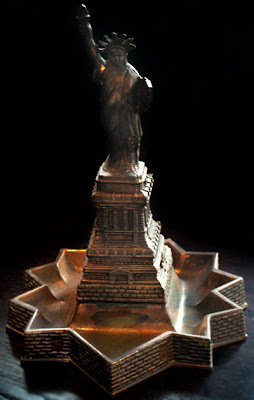 Normally a common souvenir to find, Statue of Liberty replicas can sometimes have variations which make them a bit more unusual and interesting. I bought this one because the souvenir building replica includes the star-shaped structure which surrounds Ms. Liberty. The real statue stands upon a granite pedestal inside the courtyard of the star-shaped walls of Fort Wood (which was originally built for the War of 1812.) The United States Lighthouse Board had responsibility for the operation of the Statue of Liberty until 1901. After that, care and operation of the Statue was placed under the War Department. A Presidential Proclamation declared Fort Wood (and the Statue of Liberty within it) a National Monument on October 15th, 1924 and the monument's boundary was set at the outer edge of Fort Wood. In 1933, the administration of the National Monument was transferred to the National Park Service. On September 7, 1937, jurisdiction was enlarged to encompass all of Bedloe's Island and in 1956, the island's name was changed to Liberty Island. Do you have an uncommon replica of a typically common souvenir? I bought this same replica because of the Fort on the bottom. You just don't see that every day. I was told by an other building collector that there is one of the Washington Monument with the scafulling when they were working on it a few years back...I never saw it around here and I live in DC! The Fort portion might have been intended as an ash tray...but I would NEVER soil my replicas that way. Yes, Michael Graves designed the intricate scaffolding during the Washington Monument’s renovations a few years ago. I’ve never seen a miniature replica of the monument with the scaffolding – if anyone has one, send me a photo of it.